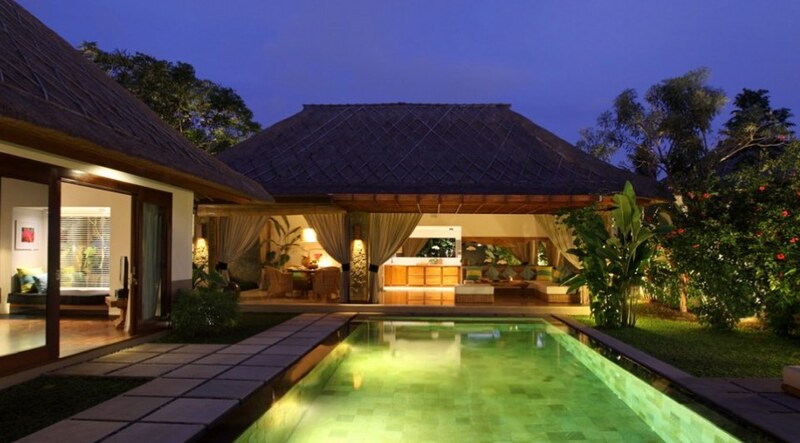 If your thinking about having your honeymoon in Bali or are just wanting a romantic escape where you and your partner can relax and unwind in your own private pool villa in Seminyak, Umalas, Canggu, Ubud, Petitenget or Legian, then following are some incredibly stunning villas that are also really affordable. This means that the both of you can have your honeymoon in complete privacy & in a luxurious villa all on a reasonable budget. Imagine lounging around by your own private pool and having some private time together (unlike hotels where there are other guests around). This is what makes a honeymoon in Bali so perfect and staying in a villa just enhances the whole experience. One thing we can promise you is this: we will make sure your honeymoon time is absolutely perfect. Please read on and see our favourite and most popular honeymoon villas that are not only gorgeous but also very romantic. Most of the villas come with breakfast included, housekeeping, security, reliable and fast wifi as well as free airport pick up. 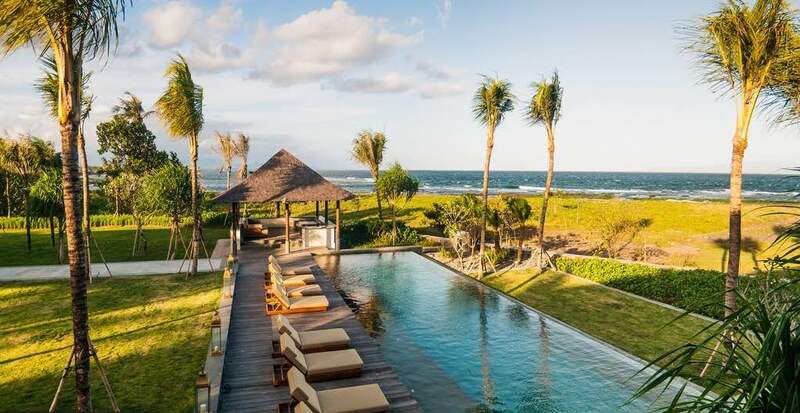 Please note that if you want to browse our selection of other Bali villas in different areas, use this site as we have a selection of over 525 stunning villas dotted throughout the island. 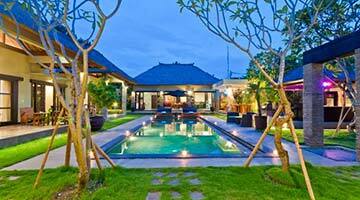 Most honeymooners love the Seminyak & Canngu areas and this is where we manage most of our villas. They are all hand picked and simply stunning. Make sure you fill out the villa inquiry form or chat with our friendly reservation team online – we are open 7 days & waiting to help you get that honeymoon holiday villa of your dreams. 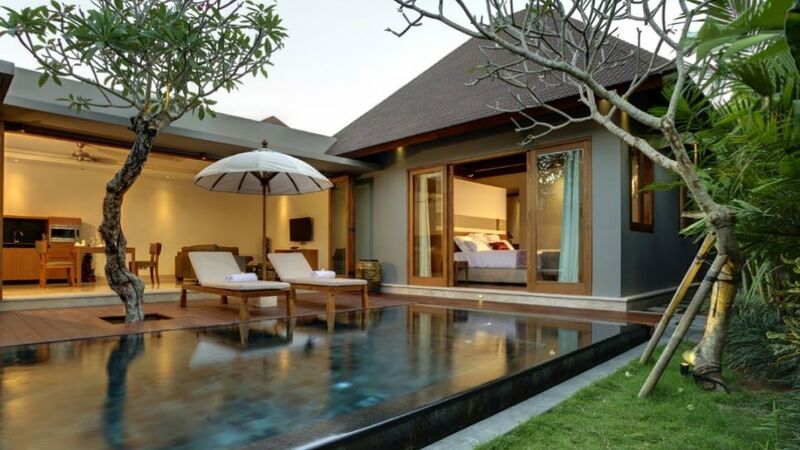 For an unforgettable honeymoon in a fabulous private villa tucked away we recommend The Layar. 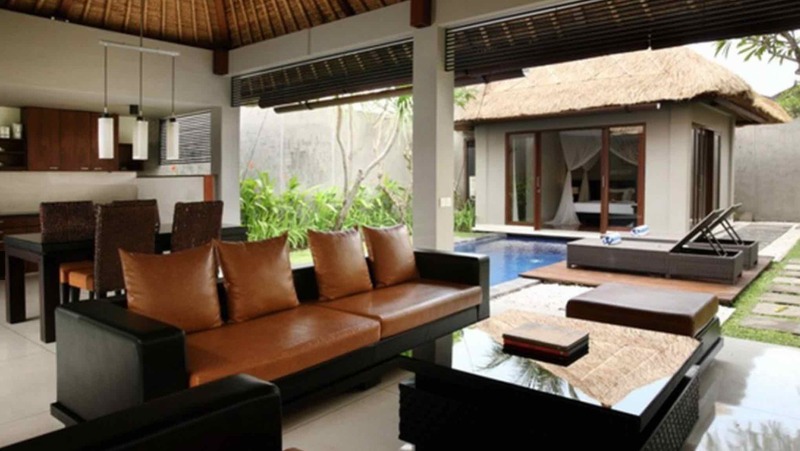 This is a really affordable 1 bedroom sensational villa in the popular tourist area of Seminyak. Have fabulous meals at world class restaurants nearby such as Sardine, Sisterfields, Potato Head or Ku De Ta and enjoy loads of honeymoon shopping (if you can drag yourself away from the villa), after you spend the morning lazing by your own private pool. This is a stunning villa and gets booked out very quickly so please plan this well in advance. t’s really beautiful and the tropical gardens surrounding the pool area are gorgeous. 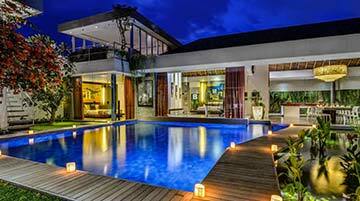 This is a budget friendly honeymoon villa that is in a top central Seminyak position. 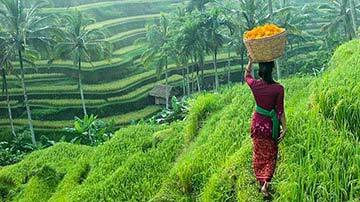 This is perfect for your honeymoon or for a couple travelling to Bali on a budget. Your in the heart of Seminyak so there are loads of cafes, bars and restaurants nearby. Try: Potato Head or Ku De Ta ( for sunset cocktails), Kynd (great organic food), or head to Seminyak Village which is the centre of Seminyak’s shopping and dining precinct. For a private and very secluded villa in Seminkak that is really well priced try Villa KoenoKoeni. It is a spacious 1 bedroom centrally located villa with a fabulous pool. It has a very modern feel to it with all the added extras you would want on your honeymoon – just think about all those Instagram pics you will be adding of the 2 of you by the pool with the free wifi. FREE airport pick up and in house villa staff included. You are really close to Eat Street where there are many places to go out for a meal or a few drinks. 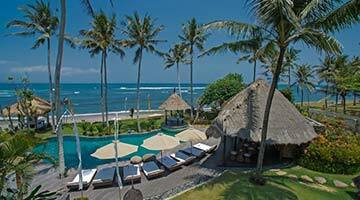 At Bali Villa Escapes we will get you the best deals on all your honeymoon villas. 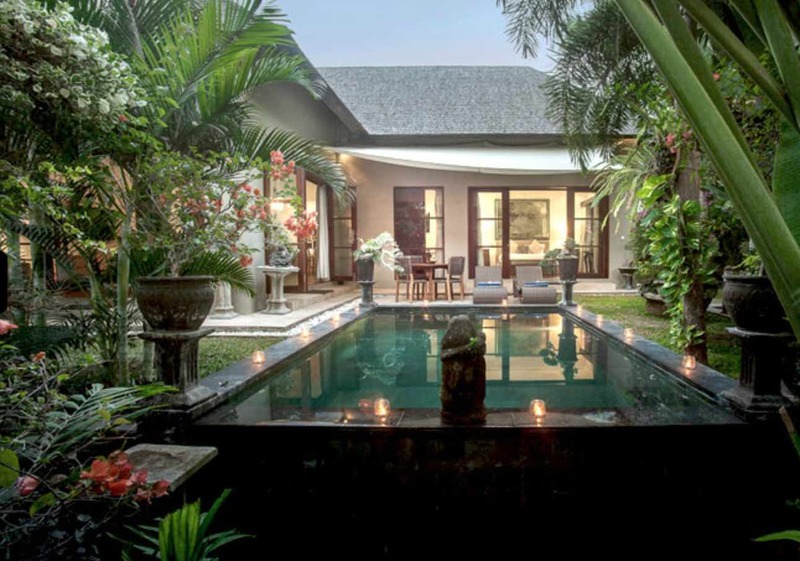 Villa Saba Arjuna is an ideal villa that’s located minutes from the beach in the quieter area of Canggu. This is such a great honeymoon or couple villa as it’s in a peaceful Balinese area that’s worlds away from the hectic and busy Seminyak. Fully staffed, with villa manager, housekeeping & security this is a great villa to relax and enjoy some serious ‘alone time’ on your honeymoon. Seminyak is only 10-15 min away by taxi and the popular Berawa area where there are loads of cafes and restaurants is 5 min away by taxi. 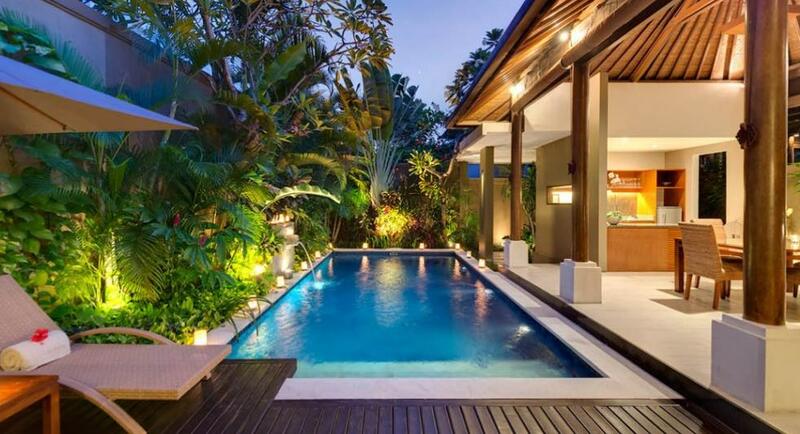 Here you get the best of both worlds; privacy, tranquility, yet close to everything! If your idea of a perfect honeymoon is to be near all the best shops, bars and restaurants in Seminyak whilst still maintaining absolute privacy and peace then Villa Sky 1 is a MUST SEE honeymoon villa – you could not get a more central location in Seminyak. It’s part of a complex of villas yet you get the feeling that you are the only couple in the world having a romantic escape. Plus it’s seriously well priced considering your location and all those fabulous cafes, shops, bars and health food shops nearby. 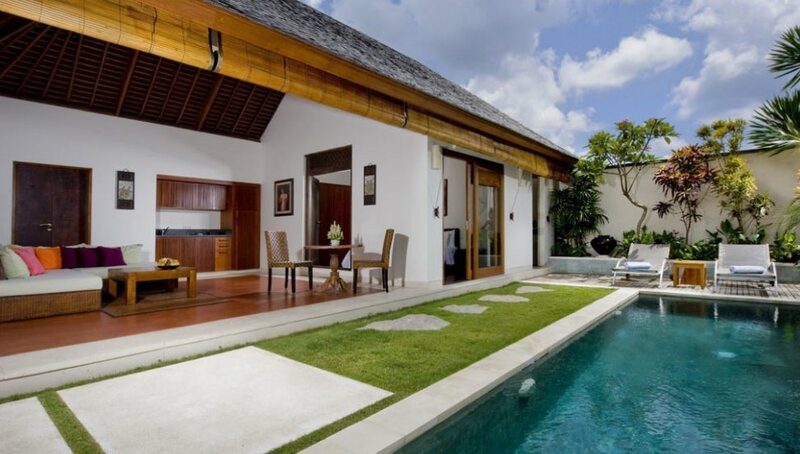 Villa Solo Lakshmi is a perfect honeymoon villa with an amazing pool area. The location is also fabulous as it’s right in the heart of Seminyak – spend some quality romantic time together and after a realxed day by the pool chilling out. Why not make your way to Eat Street where all the hip and very trendy bars and restaurants are located – perhaps a sunset cocktail at Ku De Ta, Whoo Bar, Mrs Sippy or Potato Head? This is where memories are made. Chat with us and we will get you the very best price for this honeymoon villa. 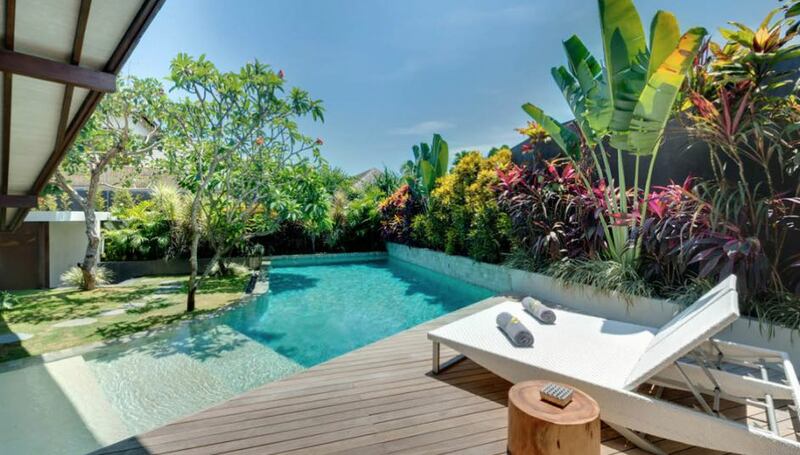 Villa Avalon in Canggu has a central location with a private pool and every conceivable added extra you could possible want for the 2 of you. Enjoying your honeymoon here will be really easy as you are close to so many popular restaurants and cafes in the peaceful and really chilled out area of Batu Belig – still close enough to Seminyak but really near the beach. It’s like having a whole house to yourself – you really should check this out. You are only a short stroll to the famous and very popular Eat Street. Enjoy the fabulous location of Villa Nunia where you can see the sights and sounds that make Seminyak so vibrant and exciting. It’s got a great swimming pool and the garden area is perfect for some wonderful honeymoon time. If you want a modern and luxurious villa that really ticks all the right boxes for your honeymoon then Villa Jerami is perfect. Great location, lots of space, king sized bed, free wifi & airport pick up and on top of this you daily healthy breakfast is included as well. This is the perfect honeymoon holiday villa where the lucky couple can relax and experience a wonderful Balinese setting. 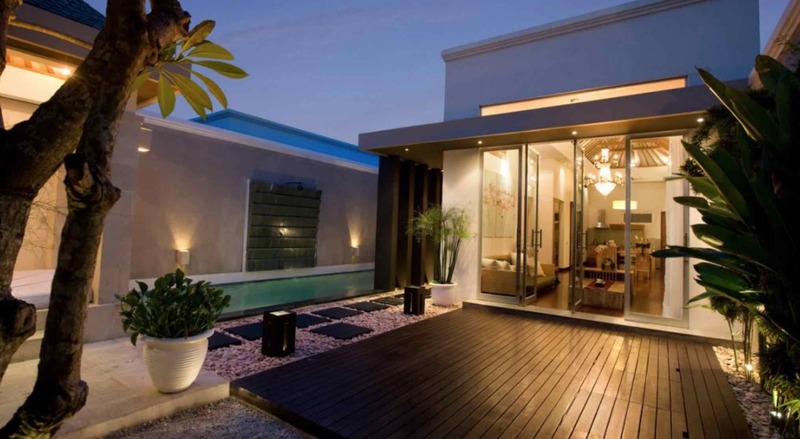 The Seiryu Villas will take it up another level in terms of luxury. Here you pay a tiny bit extra but as soon as you enter the villa gates you will see the difference. If it’s your honeymoon you deserve to be totally spoiled in this gorgeous 1 bedroom oasis. It’s in the centre of Seminyak so you are close to Eat Street, Petitenget area as well as famous day clubs such as Ku D Ta.